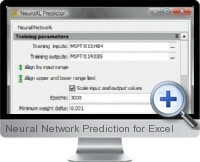 Excel Neural Network Clustering and Prediction is a neural network analysis and forecasting tool that quickly and accurately solves forecasting and estimation problems in Microsoft Excel. It is designed from the ground-up to aid experts in solving real-world data mining and forecasting problems. The solution interface is easy-to-use and intuitive, does not require any prior knowledge of neural networks, and is integrated seamlessly with Microsoft Excel. The software brings increased precision and accuracy to a wide variety of tasks including stock price prediction, sales forecasting, and outcome prediction. The neural network clustering solution undertakes data mining by automatically finding trends within data and relationships between variables. The clustering implements neural network structures that adapt under machine learning to optimally categorize data based on the trends and interactions. Advanced clustering analysis can be applied to a wide range of subject areas such as business finance, financial markets, research and science. The neural network prediction solution accounts for intricate relationships between input data variables for produce robust and accurate predictions and forecasts. The classifications isolated from data mining clustering processes include both linear and non-linear relationships to account for dynamic changes in data for forecasting. Easy to learn and use with no prior knowledge of neural networks required. Integrates seamlessly with Microsoft Excel. Provides proven neural network technology for powerful data mining analysis highly accurate predictions and forecasts. Utilizes on the latest in artificial intelligence research to recognize subtle relationships between variables and groups of variables through classification. Analyzes historical data to learn the interrelation between variables and factors. Detects relevant patterns in multi-dimensional data sets resulting in high-quality data mining analysis and accurate predictions.